Clint Eastwood is 8yrs old. 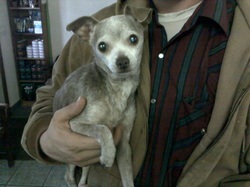 He was rescued from a hoarding situation with 65+ other chihuahuas. He has a silly personality and he loves to cuddle. He is now happily settled into his new forever home!